Common snapping turtle photo by Dakota L.
JEFFERSON CITY, Mo.—(ENEWSPF)–August 25, 2016. 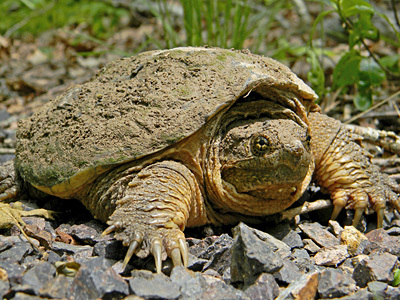 The Center for Biological Diversity and Great Rivers Environmental Law Center petitioned the Missouri Department of Conservation yesterday to end commercial collection of the state’s wild freshwater turtles. Turtle traders can now legally collect unlimited numbers of common snapping and softshell turtles to sell domestically or export for Asian food and medicinal markets. Thousands of Missouri’s turtles have been caught and sold over the past 10 years. Under current regulations in Missouri, holders of a commercial fishing permit may take unlimited numbers of common snappers, spiny softshells and smooth softshells from portions of the Missouri and Mississippi rivers with no closed season. More than 17 million wild-caught, live turtles were exported from the United States over the past five years to supply food and medicinal markets in Asia, where native turtle populations have already been depleted by soaring consumption. Because turtles bioaccumulate toxins from prey and burrow themselves in contaminated sediment, turtle meat is often laced with mercury, PCBs and pesticides, posing a health risk. Adult turtles are also taken from the wild to breed hatchlings for the international pet trade. Life history characteristics, such as delayed sexual maturity, dependence on high adult survival, and high natural levels of nest mortality, predispose turtles to rapid declines from exploitation. Scientists have repeatedly documented that freshwater turtles cannot sustain any significant level of wild collection without leading to population declines. For example, in a 2014 Missouri study researchers found that under mean demographic rates no harvest could be sustained for softshells and that common snappers could withstand only minimum rates of juvenile harvest and no adult harvest. As part of a campaign to protect turtles in the United States, the Center has been successfully petitioning states that allow unrestricted commercial turtle collection to improve harvest regulations. In 2009 Florida responded by banning almost all commercial collection of freshwater turtles from public and private waters. In 2012 Georgia approved state rules regulating the commercial collection of turtles, and Alabama completely banned commercial collection. And in July Iowa published proposed rules that, if finalized, would impose seasons, daily bag limits and possession limits for common snapping turtles, painted turtles, spiny softshells and smooth softshells. Also in response to a 2011 Center petition, the U.S. Fish and Wildlife Service in May added four turtles — including common snapping turtles, smooth softshell turtles and spiny softshell turtles that are found in Missouri — to a list called “CITES Appendix III.” Trade in Appendix III species requires an export permit and documentation that the animal was caught or acquired in compliance with the law, allowing the United States to monitor trade closely. The animals must also be shipped using methods designed to prevent cruel treatment.